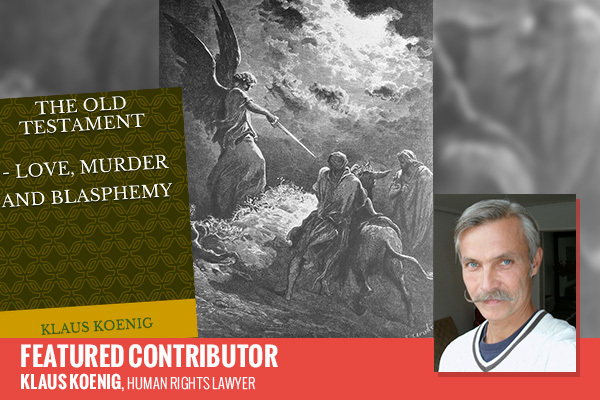 Featured Contributor Klaus Koenig previews his latest book, The Old Testament – love, murder and blasphemy in which he adapts the stories for modern times. In The Old Testament – love, murder and blasphemy the donkey of Bileam suddenly starts to speak to its master – just like in all other editions of the old script. But in this new version it is told with a clear irony that makes it more palatable without spoiling the story. Of course, the snake also speaks to Eve just like all other miraculous events are being retold in accordance with the more well-known versions. But the present day distance is apparent throughout the book, making the reading of the Old Testament a new experience for all – even the ones who have learned the stories by heart. In times where discussions of freedom of speech in relation to religion are abundant, a new and somewhat critical version of the Old Testament should be welcomed by everyone. It’s important that freedom of speech is not considered as a tool merely made to criticize other religions. And we have to prove it: show, don’t tell. In Denmark, The Old Testament – love, murder and blasphemy sparked a vivid debate amongst ministers, bishops and believers in relation to the following question: Can we improve the reliability of the Bible by cutting out the Old Testament? Many Christians today do believe that the older parts of the Bible only serve as good stories, made to explain the (then) unexplainable. They tend to focus solely on the New Testament. And if we look at it, this was exactly why Christianity came about: It was a more modern religion adapted to the changing society. Now, why is adaptation being seen as such a terrible threat to the world’s most dominating religion? More likely, the lack of adaptation will be the death of Christianity – in 2015 donkeys do not talk to their masters. Download the Kindle Edition of The Old Testament – love, murder and blasphemy on Amazon. Klaus Koenig is a Human Rights Lawyer who has worked for United Nations in many countries - most of them Muslim. He is an advocate for basic democratic rights; freedom of speech being one of them.